Buy here pay here car purchases aren’t difficult to understand. If a person is making a BHPH purchase on a vehicle, it simply means that they will be making payments at the location where they’ve purchased their used vehicle. They will still have to check your credit. You will still have to make your payments on time. Most likely they will install a tracking device on your purchase. Some dealers install a switch that will not allow you to start the car if triggered. You will in all likelihood have to make biweekly payments. About half of buy here pay here dealers do not report to the credit agencies. BHPH interest rates are higher than you will get with conventional financing. Sometimes the dealership owner is who is actually carrying the note, which is most often the case. However there are times when a buy here pay here lot has a local backer that is doing the financing. Even if the dealer owner finances the vehicle they can end up selling the note, just like happens with home mortgages. There are actually financial institutions that approach buy here pay here lots (both large and small) and offer to buy their current customers loans. Most buy here pay here loans have to be paid weekly or biweekly, and not all buy here pay here dealers report to the credit agencies. It’s best when a consumer is trying to establish or re establish credit and are buying a BHPH car that they check to be sure that their particular dealer reports their positive payments to the major bureaus. Often is the time that a person makes steady payments for a few years on a buy here pay here purchase only to find out at the end when they think they’ve done something positive for their credit history. That the loan they’ve faithfully made payments on has done nothing for their credit because an unscrupulous dealer has not reported. A little known fact is, it actually costs a dealer to report to the bureaus. It’s good to be trusting in life and we all think we’d like to believe what we’re told. But reality often is a lot different than what we hope for. It’s OK to be trusting of others, but that doesn’t mean you shouldn’t verify the truth of what you’re being told. Make sure that the buy here pay here dealer you’re purchasing from reports your positive payments. Otherwise you’re buy here pay here car purchase will do nothing for your credit score either way. Is Buy Here Pay Here Ever a Good Thing? Yes definitely! If you’ve had credit problems and need to get re established it’s the best way to do it. And you can get good cars from buy here pay here lots, just make sure your mechanic takes a close look at it first. If you’re a first time buyer with no credit history and need a way to get established without a cosigner BHPH purchasing can be a god send. Everyone has to start somewhere in life, and look at if from the car lot’s perspective. 40% of all buy here pay here cars will have to be repossessed due to the purchasers defaulting on them. It’s a big risk to a dealer to sell a car under a buy here pay here contract. Welcome to the Buy Here Pay Here Louisville KY Used Car Site! 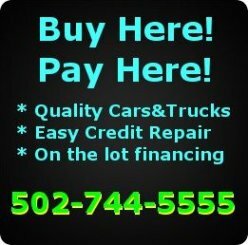 Simply put, if you’re in the market for a great used car in Louisville KY and are “credit challenged” at the moment, we’re here to help. We have a large selection of high quality used cars available for you to choose from and are eager to help you with your transportation needs. Don’t let the bad economy or unfortunate circumstances keep you from thinking that you can’t still get yourself a good car. You Can! There are a lot of negative things that can happen to a person with a lifetime of good credit these days, and we know that. But you know what? We Americans are a mobile society, and Louisville is no exception. You still need a good car to get to work and back in. The kids still need to be taken to their events, and we still have to make it to the grocery store and the Doctors office. It takes a good car to get from point A to point B, and that’s where we come in. We get people with bad credit (for whatever reason) into good quality used cars and trucks. Click our inventory link up there, then shoot us some information via our Pre-Approval form or you can always just call us.